I easily found coverage online that indicated it was a document that was signed. Whatever was signed might have been a nonbinding commitment, but it was implicity stated that a document was signed. That aside, I'm not sure what your point is about whether Iran "signed" a nuclear deal. It was agreed upon in exchange for sanctioned being lifted, with the clear understanding that Iran's violation of the deal would lead to its revocation. What does any of that have to do with Trump bending over for Kim Jong-Un? He's still promised to end military training in the Korean peninsula (without informing the Pentagon or South Korea) and to remove US troops from the peninsula and continues to praise Kim as a "great guy" while his own staff says there's a "special place in hell" for our real allies. Face it, this administration is in over its head and has no clear vision for any type of policy, foreign or domestic. The fact that the Cult 45 clan keeps falling for the sales pitch of a NYC elitist/TV celebrity is fascinating and more than a little sad. Is this the Trump foreign policy doctrine in action? Lol. KJU threatens to blow up the US, and then gets a summit with the American President saluting his general. Such a display of "balls". So Trump's pushover deal with Kim Jong-Un isn't official until Congress approves it? You must be struggling here if the best you can do is come up with another irrelevant deflection. It must jsfa to constantly have your president make you look like an idiot. Doesn't matter. There is no rule that a US president is obliged to return a salute, which is considered a sign of mutual respect. Trump himself made the decision, on behalf of America and every American veteran and war hero, to pay respect to the military of a hostile dictatorship that just months ago threatened destruction of you, your family and the United States. Why is the POTUS giving respect to a general from NK? I'm not the one who feigned outrage over Obama. You guys did. 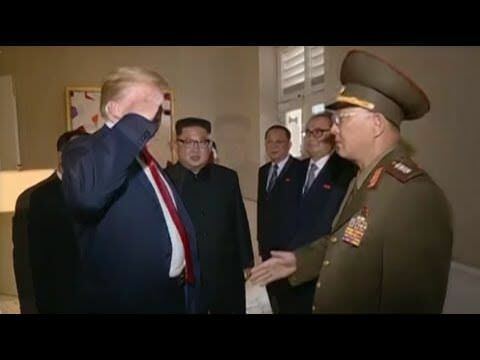 Now you have our POTUS saluting the uniform of an outfit that very recently murdered an American citizen, and you're too chickensh!t to call this POTUS like you did the last one. You guys are a bunch of broken cucks. Too funny.